I thought I would never say such a thing but Communism is good. There is a qualification though. Are you ready for the dictatorship of the Federal Government? Communism is good for a society that has lost its way, is doomed as a free society and needs to be under dictatorial leadership. Communism is good for the people that have become immoral, lazy, indolent, shiftless, dishonest and depraved. The dictatorship of the bureaus is here and getting bigger as our lazy and immoral numbers swell in America. A great many of the population of the United States of America has been seduced into worshiping “The Church of The Almighty Federal Government.” Many of us are not independent, freedom loving truth seekers. A very high percentage of the population has been led to believe that they deserve something from their fellowmen for absolutely nothing, they just deserve it. The recent Occupy Wall Street movement demonstrated their desire for Socialism and Communism and to destroy Capitalism. The end result would be that the government controls and owns everything. Right now we are a quasi-socialist republic. We are not governed by a limited Federal government with the states and individuals retaining most of the rights anymore. Since the recent Supreme Court decision regarding Obamacare in which Justice John Roberts allowed the usurpation of the Federal to mandate to individuals anything the Federal wants, we are now under a dictatorship of the Federal. We are no longer free by yet another degree. Technically, the Federal can dictate to a free man that he has to eat broccoli or suffer consequence from Federal authorities. My point here is that if we as a society were paying attention, loving our neighbors, serving the God of Righteousness, we would not be in this mess. We have gotten lazy, expecting a dole, a handout, a free lunch, and something for nothing. There is always a trade-off for something. We have been seduced by the infomercials of wicked congressmen. We got our free trial. Now the recurring payments are attached to our lives and the bill is coming due. Mitt Romney is right. He will not get votes from many seduced by the Federal Freebie gravy train. “…Our Constitution was made only for a moral and religious people. It is wholly inadequate to the government of any other.” A signer of the Declaration of Independence, the Bill of Rights and our second President. Obama has hired Communists and Marxists all around him and was raised by Marxists and hung out with them in college. They are his buddies. Van Jones is the only Communist that I know of who was removed when it was shown clearly that he is a Communist. Van Jones was apparently one of the founders of the organization called STORM. 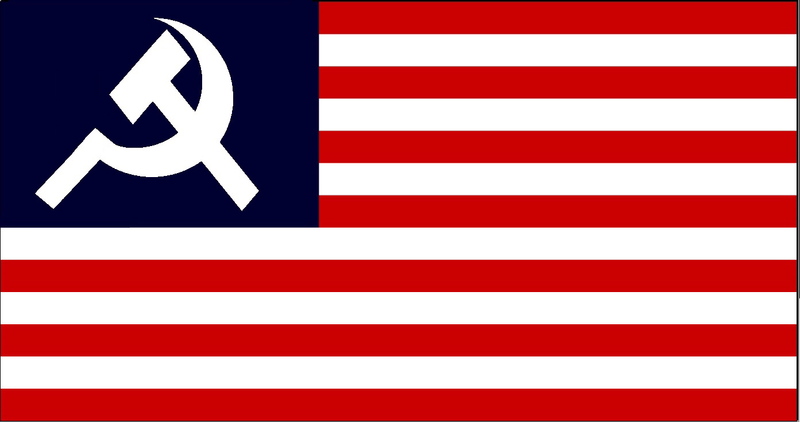 This organization expressed extreme sadness at the fall of the Soviet Socialist Republic and that China was not as hardline Communist as in times past. Hard to believe that we elected a president that hires Marxists and Communists? If we are seduced enough as a people and become the land of the Freebie’s and Home of the Depraved, then we have no other choice than to have Communist masters. The lie is that it is better. If and when the transformation is complete, we will have the hammer lowered upon our liberty and the sickle sever the freedom from our bones. Be free and in that freedom, choose righteousness which is the only true happiness. May we save ourselves from our lesser selves and may God Bless America as we change our unrighteous ways. In 1961 a private citizen Ronald Reagan spoke out against socialized medicine. Who could say it better? We’ve already set the precedent of socialized medicine with Medicare / Medicaid. Abolish it. We’re not a totally stupid nation are we?. There are solutions to get a free country. Communism and Socialism are not the answers. Ever been to any government run clinics, or facilities? I haven’t been impressed. We done have to wait to see what government run healthcare would be like. States, counties and some Federal programs already exist. We see evidence of low quality and a high degree of apathy. Many veterans struggle to get what they need and the layers of bureaucracy are stifling. Ever drive by a government run road crew? 9 guys standing on their shovel handles and 1 guy digging. I worked for a city parks department at one time. I liked the guys but the motto was = Good enough for Government Work. The other phrase was = In 100 years who will know the difference. It simply is the attitude of centralized bureaucratic largess. I’m not a Veteran but I hear the VA hospitals are usually riddled with problems. Poor quality care, apathy, corruption and no alternatives. 1. Choice – Who has addressed the problem of where will the Canadians for their high quality care? Mexico or Cuba? 2. Accountability – Imagine trying to sue a doctor for amputating the wrong leg or leaving surgical equipment inside your body. Ever try to sue the Federal Government? Wait in line, fill out this form, no there’s no one that can do that, we’re all out of that. What mechanism would be there to improve things? A bureaucrat trying to fix another bureaucrat? Think of all the government departments that you’ve dealt with. How would you rate their quality. On July 30, 1965 we let the camel’s nose in the tent – Medicaid and Medicare. Our step to socialized/communized medicine started then. Can the people get the government totally out of the business of health care? Anyone remember Soylent Green? It is a 1973 movie staged in New York City in the year 2022 staring Charlton Heston. The Government has total control over every aspect of peoples lives. For example, deadly people mover crowd control tractors and other extreme measures are used to control riots in the streets. With food supplies running short a new food source, Soylent Green, has come to the rescue with the new food source. Real food is outlawed and the black market prices for strawberry jam and other real foods items are astronomical. Charlton Heston’s character seeks to find the origin of the new food source. He follows his relative through the government run euthanasia center and discovers that “SOYLENT GREEN IS PEOPLE!” Talk about recycling. What will we do to ourselves next in the name of emergency? Watch the full movie here and see what an all powerful Federal Government could be like – running our lives from birth to death. How long will we allow those who govern our laws have us feed on ourselves? It’s 1 hour and 36 minutes. Are You An American? No, Really? Question: What makes a True American? Is it where you were born? Answer: A True American Knows and Lives correct principles of government. I’m calling on all US citizens. If you claim to be a citizen of the United States of America, prove it! Do you know what the correct principles of government are? Have you read the US Constitution, every word of it? Do you understand it? If you haven’t read every word of it are you really an American in the true sense of the word? “The Ugly American” a 1958 novel portrayed the United States losing the struggle with Communism overseas. It portrayed arrogant Americans overseas failing to understand the local culture. Now are we the Ugly Americans at home? Have we failed to understand our United States culture of what it takes to be a free nation? If you haven’t read, studied and understand the foundation of your government, the Constitution of the United States of America, you are dangerous and an enemy to freedom. Voting is power transference and requires responsibility just as driving a car requires responsibility as the driver transfers power down the road. You can be reckless with your vote just as much as with a car. An ignorant voter is a menace to society. Ignorance is enemy #1 to good government. A stupid vote can destroy a brilliant vote. Too many stupid votes kill truth, freedom, justice and the American way. What we end up with is Greedom, Surfdom, not Freedom. Socialism is simply collective greed and life on a lower common denominator. To limit access to power you must limit the collection of power. The balance of power as intended in the founding document has been warped. If you haven’t read, studied and understand the Constitution you are intentionally or unintentionally a Communist, Socialist, Fascist, Anarchist or generally exhibiting Anti-Social or Destructive behaviors. If you are willfully participating in or flirting with any of the above foolish political farces you are set up for drastic disappointment, a classic failure to deliver and you are contributing to the degradation of the finest governmental principles and community on the planet. “We the people…” That’s about it. Many I’m sure don’t even know that much. There are far to many of our citizens that are drinking the Fool-Aid. Many of our leaders are simply stupidly, ignorantly or maliciously voting against constitutional principles for their own personal benefit. If we tested all our Congressional and Executive leadership on the Constitution that they swear to uphold how well would they do? How do you know if your leader is stupid, ignorant or malicious? Stupid is as Stupid does. There are some who do know and care but it is a sad few lonely representatives. It is abundantly clear that Communism, Socialism, Fascism, Anarchism and all other derivatives of the failed social wrecking machines are and have been a failure throughout time – every time. It’s the definition of insanity to keep doing what doesn’t work time and time again. Slamming your head into a brick wall hurts every single time until the brain is dysfunctional and unable to process. Every experiment with Socialism/Communism in America (and elsewhere) has failed so why do we think our current experiment is any different. Are we that politically brain dead? Why embrace failure? Why choose leaders embracing socialist and communist policies? Socialism is Anti-American, counter to the founding principles of the United States of America. Our government is right now what the founders worked so hard to prevent. In the preamble of the Constitution it says “…..promote the general welfare”. It does NOT say “provide specific welfare”. In the early 1900’s the liberal Supreme Court broke tradition of not allowing the US Government to be in the charity business and opened the treasury to Congress for whatever Congress wanted to do with the peoples money as long as it fit into the “general welfare” category. If I were alive I would have heard the That was the camel nose. The whole camel is in the tent now and “We The People” need to kick the camel out! I proclaim again that all US Federal government welfare must end. Social Security, Medicaid/Medicare and all non constitutional departments, programs, and expenses must be done away with. Wipe out Social Security/Medicaid/Medicare NOW! They are way outside of the spirit and letter of the Constitution. Let charity start at home not at the Fed. If you think Social Security is anything other than welfare, think again. Read every word of the Constitution and its amendments. If you haven’t done so yet, here is a free link . See what it is we are all supposed to be abiding by and see if you agree with the changes that have been made to it. Be an American, a true freedom fighter! Read it, understand it, do it. It is still time to clean house.